BACKGROUND: Prior to joining Alcons, Rahn was the north american sales manager for Renkus-Heinz for 15 years. 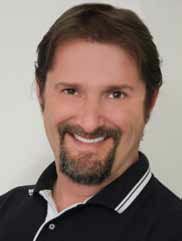 David Rahn: North American sales manager, Alcons Audio U.S. I am responsible for all aspects of sales in the North American region including channel management, brand development, and customer service. DR: After negotiations and business plan development with the ownership of Alcons Audio, we established the U.S. offices in June 2011, and introduced the brand to the North American Market during InfoComm 2011 in Orlando, FL. DR: Over the past 15 years I was the North American sales manager for Renkus-Heinz as well as an independent rep for many major brands including the Harman companies. These two positions gave me the experience necessary to help Alcons Audio break into the key North American marketplace. Specializing in loudspeaker technologies and working with many of the largest integrators and rental companies provided the necessary background and understanding of the marketplace to serve in this key role for a rapidly growing brand overseas, yet one that has yet to establish their presence in North America. DR: Starting up a U.S. office involves many facets. Sales, marketing, and brand awareness are at the top of the list of our short-term goals. Obviously getting sales jump started is the key goal that will allow us to continue to invest in this key market, and that requires a lot of face time. Selling a high-end solution requires that you give people the chance to see, hear, and feel the product. Thus the justification for our mobile office and demo systems. Long-term goals include infrastructure development (U.S. manufacturing base) and sales channel development. Hiring inside sales and technical support personally, while developing long-term relationships with our network of dealers, consultants, and sound designers all play a vital role in the long-term growth of Alcons Audio. DR: Time management and organizational efficiency is the biggest challenge. I’m personally used to having a well-developed infrastructure to support my activities. However, being a “startup” is both exciting and challenging and, that is what I was looking for when I made the choice to join Alcons Audio. One of the key factors behind my choice was the fact that Alcons Audio has some amazing product that I think sets a new standard for high output loudspeaker systems. Having been established in 2002, Alcons Audio is a fairly young company as compared to our key competitors. But due to the unique and evolutionary technology behind the Alcons Audio systems, as well as the business philosophy and dedication to the long-term goals from ownership, the company is growing rapidly and quickly developing a solid reputation for quality, technological advancement, and customer support. DR: DSP and amplification technology has moved forward in big ways, yet the acoustic tools we use have not evolved much. Compression drivers are a very old technology and have significant limiting factors. Our ProRibbon technologies overcome many of these shortcomings, and the proof is not only measureable but audibly apparent upon first hand listening. To me this is very exciting. It’s not often one has a chance to be a part of a major technological shift that has the potential to establish new standards for loudspeaker performance in large-scale venues. The consensus from those exposed to the Alcons Audio loudspeakers is “studio monitor performance” in a high output loudspeaker system and this is truly evolutionary. SCN: Are there new initiatives we are likely to see from Alcons? DR: There are many new initiatives in the pipeline from Alcons Audio. Amplification technology, a new series of ProRibbon devices, large format line arrays, and new cinema products are just a few of the key elements we will be introducing to the market in 2012. SCN: How can systems contractors better position themselves to profit from products and/or services Alcons has to offer? DR: Alcons Audio isn’t for everyone. We are not a “me too” brand offering similar SKUs at a variety of price points, nor are we attempting to be the brand for everyday, budget-driven projects. We offer extremely high-quality solutions and are designed for the most demanding applications where fidelity, uniformity of coverage, and direct factory support at every level are a critical component of the decision making process. We are happy to live in the high end of the loudspeaker market and aren’t interested in volume selling or appeasing stockholders. Our goal is to provide the best tools at a competitive price point and to ultimately establish new standards for performance and customer service. That said, system contractors and rental sound companies can position themselves to be business partners with Alcons by showing a desire to be different and to embrace change and the advancement of technology for the betterment of all.